Altishahr (Traditional spelling: آلتی شهر; Uyghur Cyrillic alphabet: Алтә-шәһәр Uyghur Latin alphabet: Altä-shähär or Altishähär, Modern Uyghur alphabet: ئالتە شەھەر) is a historical name for the Tarim Basin region used in the 18th and 19th centuries. The term means the "six cities" in Turkic languages and refers to oasis towns along the rim of the Tarim, in what is now southern Xinjiang Uyghur Autonomous Region of China. Six cities (Altishahr) was synonymous with Kashgaria. Altishahr is derived from the Turkic words alti, which means six, and shahr, for cities. The term was used by Turkic-speaking inhabitants of the Tarim Basin in the 18th and 19th century. Other local words for the region included Dorben Shahr, the "four cities" and Yeti Shahr, the "seven cities". Altishahr was adopted by some Western sources in the 19th century. Another Western term for the same region is Kashgaria. Qing sources refer to the region primarily as Nanlu or the Southern Circuit. Other Qing terms for the region include Huijiang (the "Muslim Frontier"), Huibu (the "Muslim Tribal Area), and Bacheng (the "Eight Cities"). or Nanjiang. 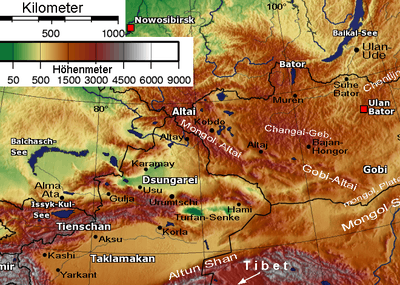 Altishahr refers to the Tarim Basin of southern Xinjiang, which was geographically, historically, and ethnically distinct from the Dzungarian Basin of northern Xinjiang. At the time of the Qing conquest in 1759, Dzungaria was inhabited by steppe dwelling, nomadic Dzungar people, Oirat Mongols who practiced Tibetan Buddhism. The Tarim Basin was inhabited by sedentary, oasis dwelling, Turkic speaking Muslim farmers, now known as the Uyghur people. The two regions were governed as separate circuits until Xinjiang was made into a single province in 1884. Painting depicting a Turkic Muslim from Altishahr, during the reign of the Qing dynasty. In the 18th century, prior to the Qing conquest of Xinjiang in 1759, the oasis towns around the Tarim did not have a single political structure governing them, and Altishahr did not refer to specific cities but the region generally. Foreign visitors to the region have tried to identify the cities and offered various lists. Albert von Le Coq's six cities were: (1) Kashgar, (2) Maralbexi (Maralbashi, Bachu), (3) Aksu (Aqsu), (4) Yengisar (Yengi Hisar), (5) Yarkant (Yarkand, Shache) and (6) Khotan, with Kargilik (Yecheng) as an alternative to Aksu. W. Barthold replaced Yengisar with Kucha (Kuqa). The term Seven Cities may have been used after Yaqub Beg captured Turpan (Turfan) and referred to (1) Kashgar, (2) Yarkant, (3) Khotan, (4) Uqturpan (Uch Turfan), (5) Aksu, (6) Kucha, and (7) Turpan. The term Eight Cities (Шәкиз Шәһәр Şäkiz Şähār) may have been a Turkic translation of the Qing Chinese term Nanlu Bajiang, literally the "Eight Cities of the Southern Circuit", which referred to (1) Kashgar, (2) Yengisar (3) Yarkant and (4) Khotan in the west and (5) Uqturpan, (6) Aksu, (7) Karasahr (Qarashahr, Yanqi), and (8) Turpan in the east. According to Aurel Stein, in the early 20th century, Qing administrators used the term to describe the oasis towns around Khotan: (1) Khotan, (2) Yurungqash, (3) Karakax (Qaraqash, Moyu), (4) Qira (Chira, Cele), (5) Keriya (Yutian), and a sixth undocumented place. Until the 8th century AD, much of the Tarim Basin was inhabited by Tocharians who spoke an Indo-European language and built city states in the oases along the rim of the Taklamakhan desert. The collapse of the Uyghur Khanate in modern Mongolia and settlement of Uyghur diaspora in the Tarim led to the prevalence of the Turkic languages. During the reign of the Karakhanids much of the region converted to Islam. From the 13th to the 16th centuries, the western Tarim was part of the larger Muslim Turkic-Mongol Chaghatay, Timurid and Eastern Chagatai Empires. In the 17th century, the local Yarkent Khanate ruled Altishahr until its conquest by the Buddhist Dzungars from the Dzungarian Basin to the north. In the 1750s, the region was acquired by Qing China in its conquest of the Dzungar Khanate. The Qing initially administered the Dzungaria and Altishahar separately as respectively, the Northern and Southern Circuits of Tian Shan, although both were under control of the General of Ili. The Southern Circuit (Tianshan Nanlu) was also known as Huibu (回部 Muslim Region), Huijiang (回疆 Muslim Frontier), Chinese Turkestan, Kashgaria, Little Bukharia, East Turkestan. After quelling the Dungan Revolt in the late 19th century, the Qing combined the two circuits into the newly created Xinjiang Province in 1884. Xinjiang has since been used by the Republic of China and People's Republic of China and southern Xinjiang replaced Altishahr as place name for the region. ↑ David Brophy (4 April 2016). Uyghur Nation: Reform and Revolution on the Russia-China Frontier. Harvard University Press. pp. 319–. ISBN 978-0-674-97046-5. ↑ ed. Bellér-Hann 2007, p. 5. ↑ Jonathan Neaman Lipman (1 July 1998). Familiar strangers: a history of Muslims in Northwest China. University of Washington Press. pp. 59–. ISBN 978-0-295-80055-4. ↑ Enze Han (19 September 2013). Contestation and Adaptation: The Politics of National Identity in China. OUP USA. pp. 160–. ISBN 978-0-19-993629-8. ↑ Ildikó Bellér-Hann (2008). Community Matters in Xinjiang, 1880-1949: Towards a Historical Anthropology of the Uyghur. BRILL. pp. 39–. ISBN 90-04-16675-0. ↑ Justin Jon Rudelson; Justin Ben-Adam Rudelson (1997). Oasis Identities: Uyghur Nationalism Along China's Silk Road. Columbia University Press. pp. 31–. ISBN 978-0-231-10786-0. ↑ Justin Jon Rudelson; Justin Ben-Adam Rudelson (1992). Bones in the Sand: The Struggle to Create Uighur Nationalist Ideologies in Xinjiang, China. Harvard University. p. 43. ↑ René Grousset (1970). The empire of the steppes: a history of central Asia. Rutgers University Press. p. 344. ISBN 978-0-8135-0627-2. ↑ Canfield, Robert Leroy (2010). Ethnicity, Authority, and Power in Central Asia: New Games Great and Small. Taylor & Francis. p. 45. ↑ S. Frederick Starr (15 March 2004). Xinjiang: China's Muslim Borderland. M.E. Sharpe. pp. 30–. ISBN 978-0-7656-3192-3. ↑ Michell 1870, p. 2. ↑ Martin 1847, p. 21. ↑ Fisher 1852, p. 554. ↑ The Encyclopaedia Britannica: A Dictionary of Arts, Sciences, and General Literature, Volume 23 1852, p. 681. Bellér-Hann, Ildikó, ed. (2007). Situating the Uyghurs Between China and Central Asia (illustrated ed.). Ashgate Publishing, Ltd. ISBN 0754670414. ISSN 1759-5290. Retrieved 10 March 2014. Bellér-Hann, Ildikó (2008). Community Matters in Xinjiang, 1880-1949: Towards a Historical Anthropology of the Uyghur. Brill. ISBN 9004166750. Dani, Ahmad Hasan; Masson, Vadim Mikhaĭlovich; Unesco, eds. (2003). History of Civilizations of Central Asia: Development in contrast : from the sixteenth to the mid-nineteenth century. Multiple history series. Volume 5 of History of Civilizations of Central Asia (illustrated ed.). UNESCO. ISBN 9231038761. Retrieved 22 April 2014. Edme Mentelle; Malte Conrad Brun; Pierre-Etienne Herbin de Halle (1804). Géographie mathématique, physique & politique de toutes les parties du monde, Volume 12. H. Tardieu. Retrieved 10 March 2014. Millward, James A. (1998). Beyond the Pass: Economy, Ethnicity, and Empire in Qing Central Asia, 1759-1864 (illustrated ed.). Stanford University Press. ISBN 0804729336. Retrieved 10 March 2014. Millward, James A. (2007). Eurasian Crossroads: A History of Xinjiang (illustrated ed.). Columbia University Press. ISBN 0231139241. Retrieved 10 March 2014. Newby, L. J. (1998). "The Begs of Xinjiang: Between Two Worlds". Bulletin of the School of Oriental and African Studies, University of London. Cambridge University Press on behalf of School of Oriental and African Studies. 61 (2): 278–297. doi:10.1017/s0041977x00013811. JSTOR 3107653. Newby, L.J. (2005). The Empire And the Khanate: A Political History of Qing Relations With Khoqand C1760-1860. Brill. ISBN 9004145508.